Gerome Meminger Sr., Born in Hampton, Virginia. 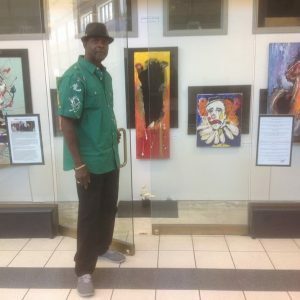 After retiring from the military, he pursued a hidden artistic passion for painting, becoming an artist, poet, and an author. Gerome’s love of music and painting has brought him to a place in his life that allows him to interpret music through a paintbrush. Gerome expresses himself on canvas in two different ways. 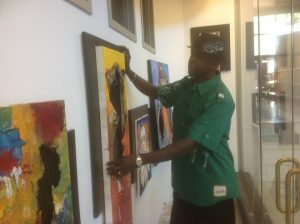 In his studio, he is the fine artist, with a colorful yet more detailed and calculated painting in mind. Now on stage, he transforms himself into a painting maestro and paints what he sees and feels with rhythmic colorful brush strokes that are bold, yet can become long and gentle depending on the music. Keeping with the tempo of the music, Gerome’s painting becomes a performance in itself. Audiences often pan back and forth between the musician and Gerome until the final note is played and his final brush stroke is made.